An apple pie is a fruit pie (or tart) in which the principal filling ingredient is apples. 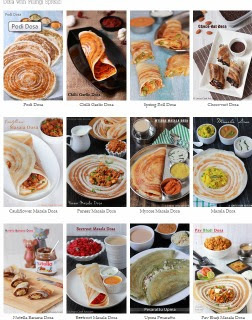 It is sometimes served with whipped cream or ice cream on top, or alongside cheddar cheese. 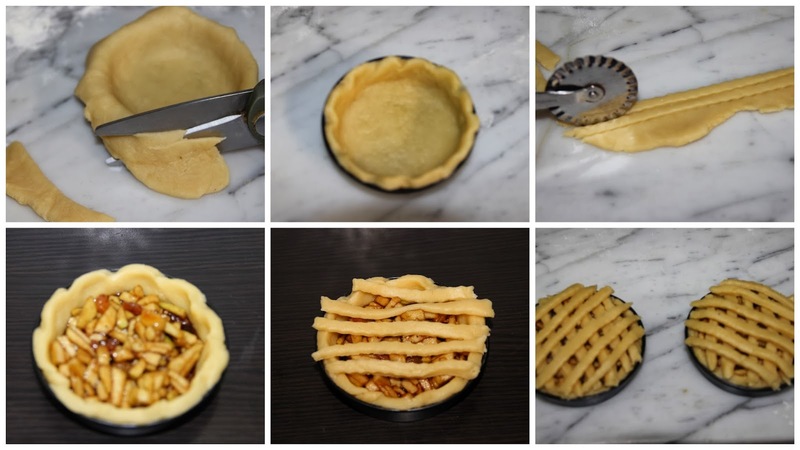 Pastry is generally used top-and-bottom, making it a double-crust pie, the upper crust of which may be a circular shaped crust or a pastry lattice woven of strips; exceptions are deep-dish apple pie with a top crust only, and open-face Tarte Tatin. Here I have made apple pie in a basket look alike shape. You can cover the filling with a normal rolled pastry and prick them at the centre to allow the steam to escape and allow the pie to cook inside. 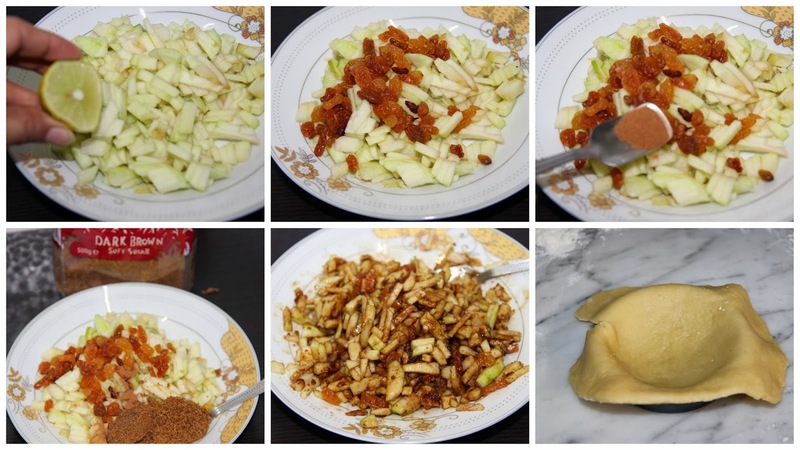 I have used Granny's Smith Green apples for this recipe you can make this with any apple which are crunchy and acidic. Combine together, all-purpose flour, salt and icing sugar. Add butter and mix gently using your fingertips until it resembles breadcrumbs. For a well inside the crumbs and add egg yolk and sufficient quantity of ice water, mix gently until the dough just comes together. Knead the dough until you get a smooth dough. Divide the dough into two parts and wrap with cling film and chill in refrigerator for 15-20 minutes. 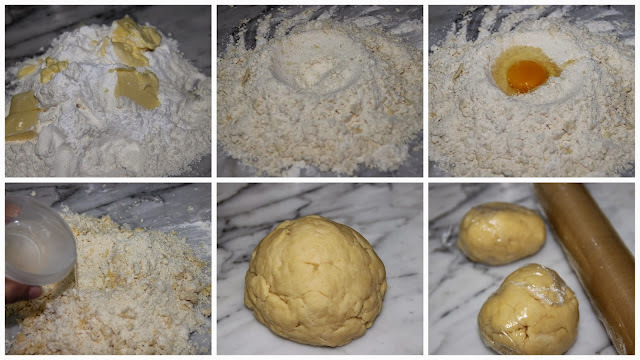 Roll the dough on a lightly floured surface until 3 mm thick and keep inside the base and cut the extra hanging pastry. In a bowl mix the chopped apple, raisins, brown sugar and cinnamon. 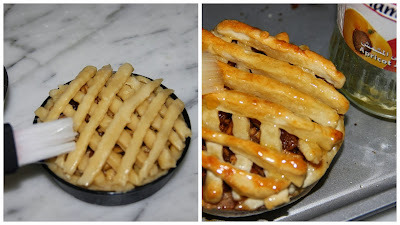 Fill the base with the apple filling up to the top and level with this using a spoon. From the remaining pastry using pizza cutter or knife cut some long strips, to keep on top of the base to shape a fruit basket like appearance. Brush the top with egg wash using a pastry brush. Transfer the tins to oven and bake till the surface turns golden. Melt the apricot jam in oven for 30seconds or in a small pan over the stove heat till the jam melts. 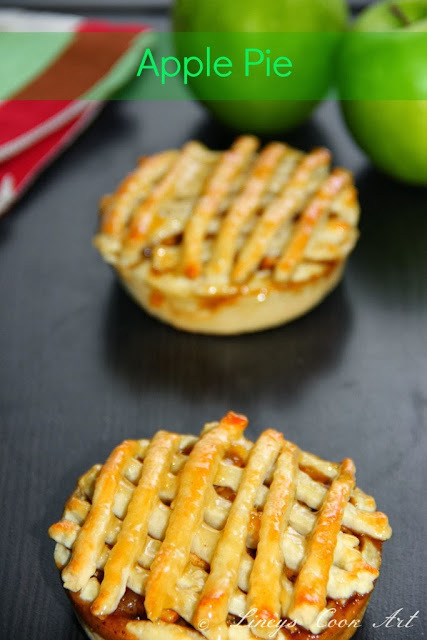 Brush the baked apple pies with melted jam using a pastry brush. Serve with whipping cream, ice cream or cheese. Makes 1 large pie or small 4 pies. I love apple pie these look really delicious and golden brown. thanks for uploading on my event . Super delicious and yummy apple pie :) looks fabulous dear !! Congrats on your 100th post.. woww! Delicious Apple pie! Congrats for your 100th post. Lovely and delicious pie; I just love it lincy. beautiful tarts dear... congrats on ur 100th post!